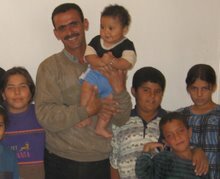 Spring 2005: Thaer Shafiq Ali Abdallah begins taking testimonies of Palestinian refugees in Iraq whose family members have been detained, tortured, threatened, or killed by Iraqi security forces or militias. 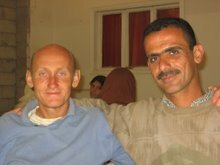 Summer 2005: Thaer makes contact with Christian Peacemaker Teams, who begin to document the threats against Palestinians in Iraq. 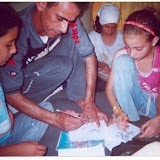 Thaer begins to make plans to lead an exodus of threatened families to Syria, to ask for refuge. Fall 2005: Thaer and others from the Palestinian community of Baladiat visit officials from UNAMI in the Green Zone in Baghdad, to share testimonies of torture of Palestinians in Iraq. 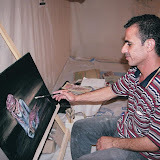 October 2005: Thaer and 18 other Palestinian refugees leave Baghdad for the Syrian border. They are accompanied by members of Christian Peacemaker Teams including Tom Fox, Beth Pyles, and Sheila Provencher, as well as a member of Muslim Peacemaker Teams and a translator. The group is allowed out of Iraq, but is not admitted to Syria. 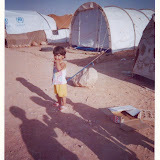 They make contact with UNHCR, who provides them with food and tents. They live on the border in no-man’s-land for approximately one month. Members of CPT stay for two weeks. November 2005: One member of the group, an elderly woman, returns to Baghdad. In mid-November, the remaining 18 refugees are allowed into Syria, but are confined to a UNHCR refugee camp next to the village of Al Hol, in the northeast corner of Syria. 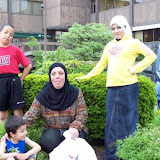 December 2005: A Palestinian-Canadian woman agrees to find sponsors in Canada for the 18 refugees. Sheila Provencher visits the Al Hol camp. February 2006: Applications for all 18 refugees are submitted to Canadian officials. The refugees are told that they may have to wait for more than one year for their immigration interviews. Violence against Palestinians in Baghdad increases after the bombing of a Shia shrine in Samarra. March 2006: Eighty-eight more Palestinian refugees from Iraq, including forty-two children, flee Baghdad on March 18. 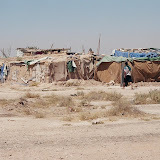 They camp on open ground in the "no man's land" between the borders of Jordan and Iraq. Two members of Christian Peacemaker Team accompanied them from Baghdad. Jordanian border officials refuse them entry, demanding that they return to Iraq. More Palestinian refugees flee in subsequent days, causing the numbers of refugees to swell to 181. 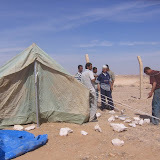 April 2006: Syria agrees to take the group of 181 Palestinian refugees stranded on the border between Iraq and Jordan. 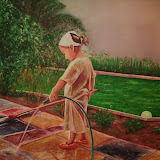 Additional Palestinians flee Baghdad upon hearing this news. Eventually about 300 Palestinian refugees are admitted to the Al Hol camp inside Syria, joining the original 18 refugees who fled in October 2005. May—June 2006: Violence against Palestinian refugees in Baghdad continues, and about 330 additional refugees flee to the Iraq-Syria border. They are not allowed into Syria, and languish in the scorpion-infested desert of no-man’s-land, housed in tents supplied by UNHCR. November 2006: Gianni Magazzeni of UNHCR states that Palestinians are “a more vulnerable group than anybody else in Iraq.” (“Iraq’s Palestinians in Bull’s Eye,” by Ken Ellingwood, LA Times, 26 Nov 2006). The article reports 60 Palestinian citizens killed in the past year, and dozens of families ordered by militias to leave within 72 hours. December 2006: The Palestinian neighborhood of Baladiat is attacked by Iraqi militias. The complex is shelled with mortar bombs for more than three hours with no intervention by Iraqi or Coalition forces. Nine people are killed and several injured. Ambulances are not allowed into the complex. In subsequent weeks, more attacks occur and 130 Palestinian refugees flee Iraq. But they are not allowed out of Iraq to join the 330 refugees already in no-man’s-land between Iraq and Syria. Instead, they are forced to stay in the desert on the Iraq side of the border. Conditions are deplorable and medical care is unavailable.